Conventional speakers might give you great sound when listening to music, watching movies, or playing games, but they shouldn’t have to be boring. Meet ten of the coolest, most creative speakers you can actually buy. 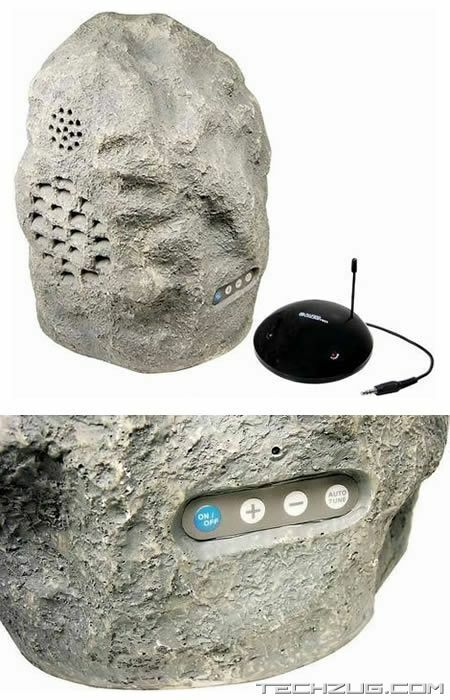 Enjoy the great outdoors with the 900 MHz wireless Rock speaker system ($81.98) that seamlessly blends into your landscaping allowing you to listen to music just about anywhere, without the hassle of running unsightly speaker wires. 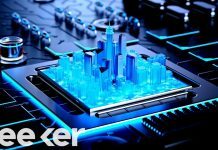 The powerful transmitter uses 900 MHz technology to send music through walls and floors to the wireless speaker over 150 feet away. What’s better than having a miniature astromech droid sitting on your desk pumping out your tunes? 2 miniature astromech droids of course. 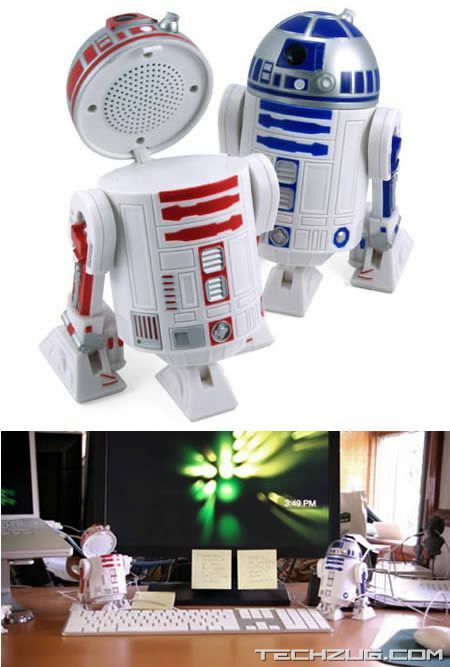 This Star Wars R2D2 Speakers ($27.95) set makes you forget how crappy they probably sound with an awesome R2-D2 and R2-D1 design. The domes flip up revealing the actual speaker, and since they’re powered by the stereo headphone jack connector, don’t expect a THX experience from this pair. 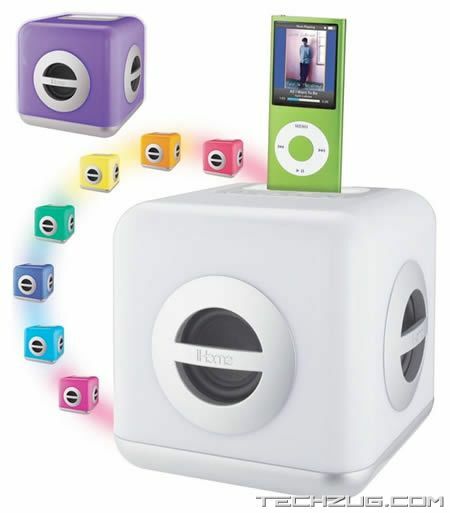 A colorful way to enjoy your favorite tunes, the iH15W Color-Changing iPod Speaker ($54.01) is a compact, illuminated cube and iPod speaker dock. Set it to one color to match your mood, or cycle through the colors for a little fun. If you love the design of your iPod earphones, but wish they packed a bit more punch, look no further. 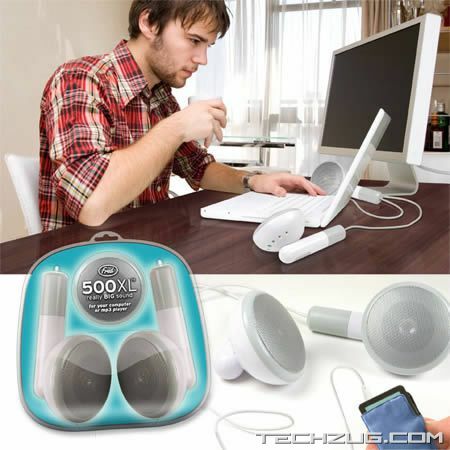 The 500XL Speakers ($39.40) are 500 times the size of the original iPod earbuds, so you can place them on your desk as a set of quirky desktop speakers. 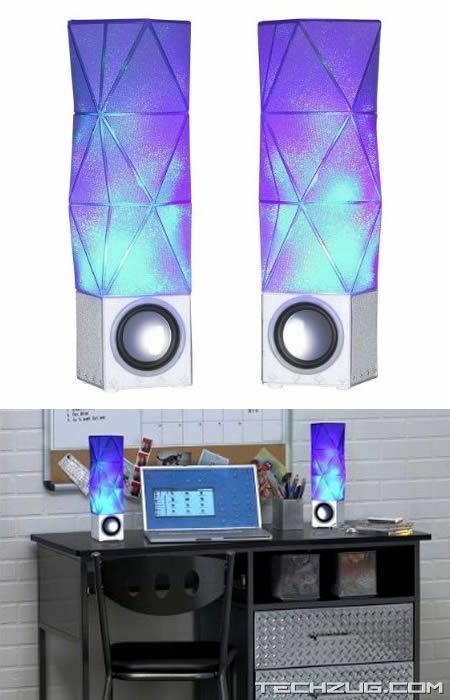 Put on a light show themed to your music with the i-Lit Diamond LED CD or iPod Stereo Speakers ($35.99). Sparkling lights race up and down these tower speakers depending on the intensity of the sound. Just plug in an iPod or any music source with the provided connectors. Disconnect your music device and the iLit speaker system will respond to the ambient sounds in the room… cool! 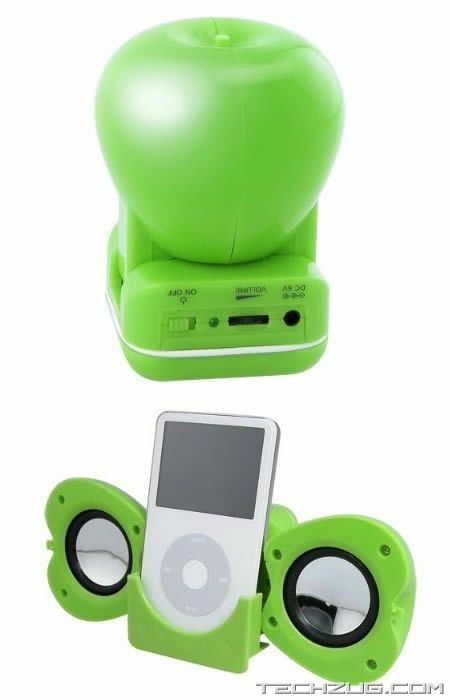 The Eforcity Foldable Apple-Shaped Speaker ($165.07) folds out to reveal a set of speakers and an iPod cradle/stand. It’s powered by 4 x AAA batteries and compatible with any audio device that has a 3.5mm headphone jack. 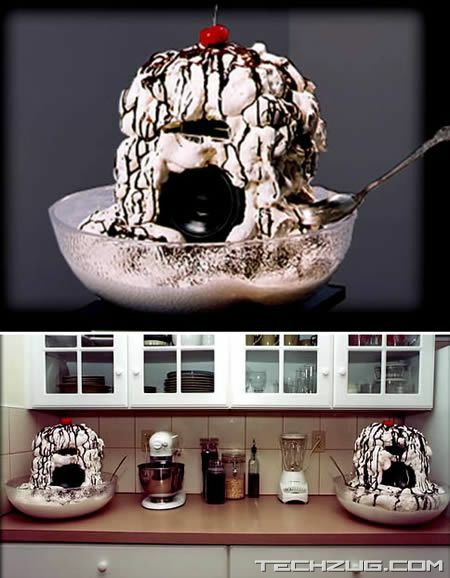 These fun, custom Ice Cream Sundae Speakers by SG Custom Sound will run you $1250 per pair… sweet deal! Pedal to the metal with the iH85B Bike to Beach Bicycle Speaker for iPod ($37.95), a water-resistant iPod speaker case that clamps to your bike frame. 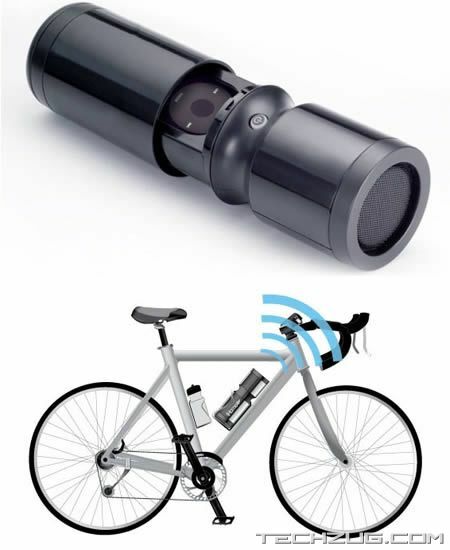 A handlebar-mounted remote control allows for safe cycling while listening to your tunes. This speaker case is perfect for the beach, poolside, and picnics, too. 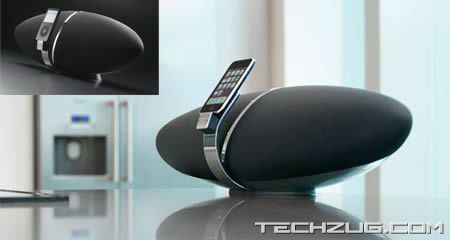 From the elegant way your iPod connects to the front of the Zeppelin Loudspeaker Dock System($599.95), to the previously undiscovered levels of clarity it gives your digital music collection this is a breathtaking piece of equipment. It doesn’t come cheap though. 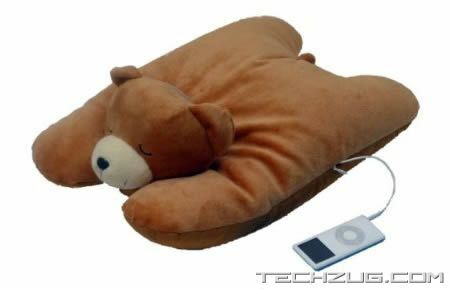 The Plush Teddy Bear Squishy Pillow Speaker ($14.99) is a huggable pillow, cute and comfortable to lay on while listening to your favorite music. Just plugin your MP3, MP4, iPod or CD player to it and enjoy your music at home or bring along on a road trip.